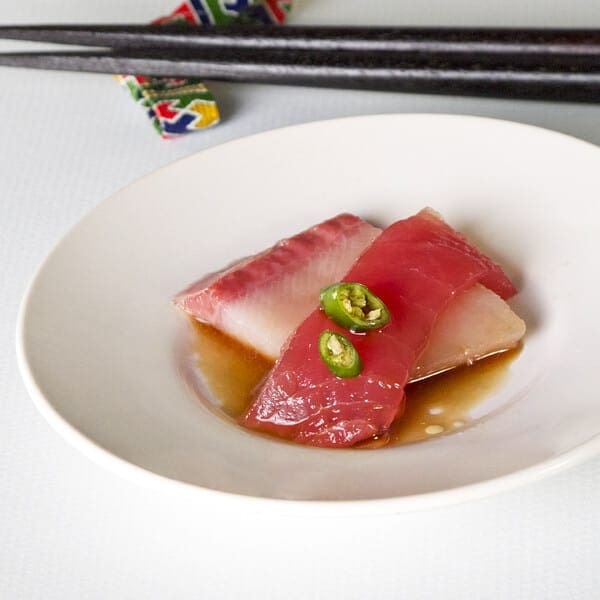 yellowtail and tuna sashimi with thai chilies and ponzu sauce. Sashimi (raw fish without any rice) has been one of my favorite things to eat for as long as I can remember. I must’ve been 8 or 9 when I had my first taste at raw fish. I didn’t know what I was eating, all I remember is that I wanted to eat more. A few days later my mother asked if there’s anything I wanted to eat in particular for dinner, I said “that thing we had not too long ago, that thing you made when all the family came over to visit. It’s pink!” and my mother said “tuna sashimi? The plate of raw fish?” and I replied “no no no, yuck!” But it turned out I was wrong; it was indeed tuna sashimi I had eaten and fell in love with that day. Since then, I eat sashimi on a regular basis and make it at home too. It couldn’t get any easier than slicing a beautiful piece of fish, plating it and serving it. The flavors are extremely refreshing, cleansing and exotic. This sashimi with ponzu recipe is a reinvented take on the classic soy and wasabi. I used yellowtail and tuna but you can use any other types of sashimi grade fish or seafood for this. Cut your fish at a slight angle and put on a plate. Add chilies and dress your fish with the ponzu and sesame oil. Serve cold. I didn’t really like sashimi the first time I tried it as a kid. Now I love it so much, I wish I had a sushi making machine at home! Thanks for the recipe.